Two comics, neither very good, but one a bit better than the other. 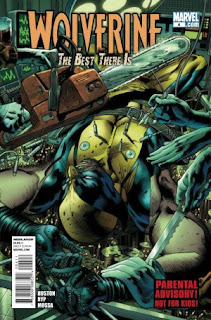 Let's get this out of the way, "Wolverine: The Best There Is," did start out pretty terrible and I was perhaps too kind in my review of the first issue. However, it has been getting better to a point now where it is almost a bit better than mediocre and the writing is getting slightly interesting to accompany Juan Jose Ryp's beautiful-yet-hideously-gory art. Charlie Huston seems to be hit or miss and this comic seems to slowly be climbing out of a pit it started in to a point of being slightly interesting. It introduces the concept of people who collect super-hero body parts online as they are weird fans--a cleverly gross idea--and has some nice dialogue between the continuing absurd violence. There at least seems to be a slight purpose to this comic at least--testing out and explaining Wolverine's healing-factor for the purpose of healing severely mutated son of a villain. It still is just a tiny bit above passable. 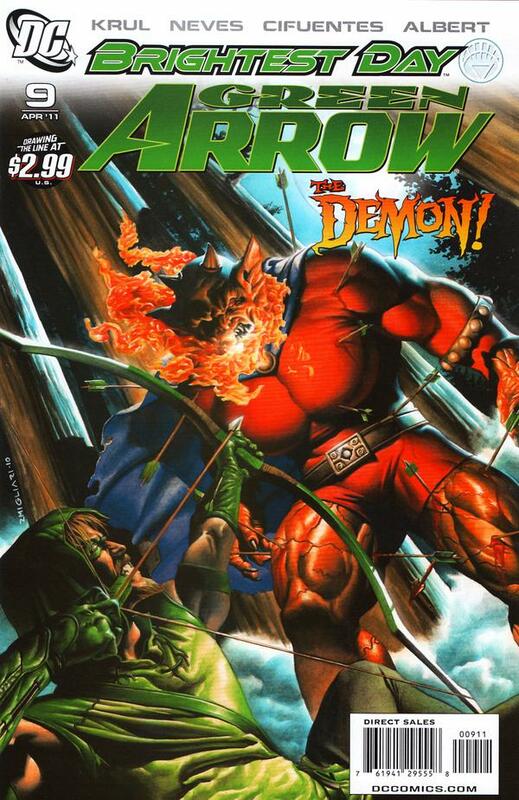 Green Arrow #9 seems to just do its usual stumbling around with the semblance of a plot, this time bringing in the demon Etrigan and the Phantom Stranger--so that the first one can poison the forest and the other can just float around, spout some nonsense, and disappear. The story acknowledges the useless nature of the Phantom Stranger, but just because a story points out a problem with its plot that doesn't fix the issue. Oh, and Oliver Queen and a guy who thinks he is an ancient knight fight a bunch of evil bugs after fending off roots and violently cutting off one of Etrigan's arms and legs...and that's it. The story just drunkenly staggers to the next cliffhanger and tells us to tune in next month. This comic has since the start been sort of just standing there taking up space, like that guy at the party who sips his drink in the corner but doesn't talk to anyone or even dance. It's just kind of...there. Wolverine seems to be slowly improving and Green Arrow is going nowhere at a fast speed. I got into comics for the occasionally amazing story that makes me think deeply or feel touched emotionally. These comics just sort of make the whole art-form look like nothing but juvenile violent fantasies or horribly dull excuses for a story. Eh, you can't win all the time.